The hip joint (see the image below) is a ball-and-socket synovial joint: the ball is the femoral head, and the socket is the acetabulum. The hip joint is the articulation of the pelvis with the femur, which connects the axial skeleton with the lower extremity. 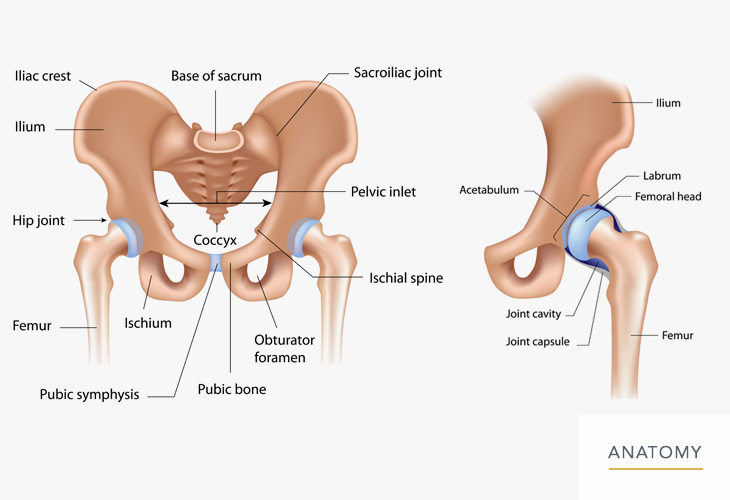 The adult os coxae, or hip bone, is formed by the fusion of the ilium, the ischium, and the pubis, which occurs by the end of the teenage years. The 2 hip bones form the bony pelvis, along with the sacrum and the coccyx, and are united anteriorly by the pubic symphysis.